Home/Coffee/The Twelve Best Coffee Shops in Tampa! What are the best coffee shops in Tampa? If you haven’t kept up recently, you may not know: Tampa has exploded with food, culture, and especially great craft coffee! Tampa, or Tampa Bay (Tampa, St. Petersburg, and Clearwater) has seen unprecedented growth in the last 5 years. Every few months a new trendy hip coffee shop opens up, many serving up house roasted beans while others bring in the best roasts from around the country. 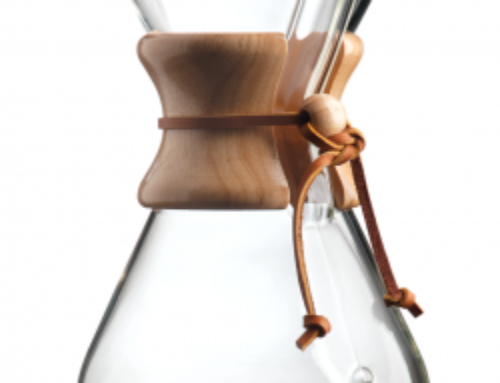 There’s something for everyone too: from the coffee connoisseur to the novice coffee drinker just looking to break away from big chains and stale java. Let’s break down the best spots! Here are the dozen best coffee shops (in no particular order) in Tampa — and why you should give them a shot too! Kôfē is the best coffee shop in Tampa to cozy up to bar and chat up the staff. First up on our list of the best coffee shops in Tampa is Kôfē (that’s the phonetic spelling of “coffee”.) Kôfē is located in the Hall on Franklin, a full-service food hall (read: hipster food court) serving everything from Poke and Ramen to fresh fish and delicious coffee. Unlike other food halls, this one is full-service, meaning you can sit down for a cup of coffee and order up some delicious eats from any of the other concepts. The Hall is great, but the best thing about Kôfē isn’t the space, it’s the owner. Ty Beddingfield has a long history in coffee (including helping Buddy Brew elevate it’s game early on.) Ty is obsessed with delivering simple perfection and it shows. Kôfē is the best coffee shop in Tampa to get a regular drip coffee. Why? 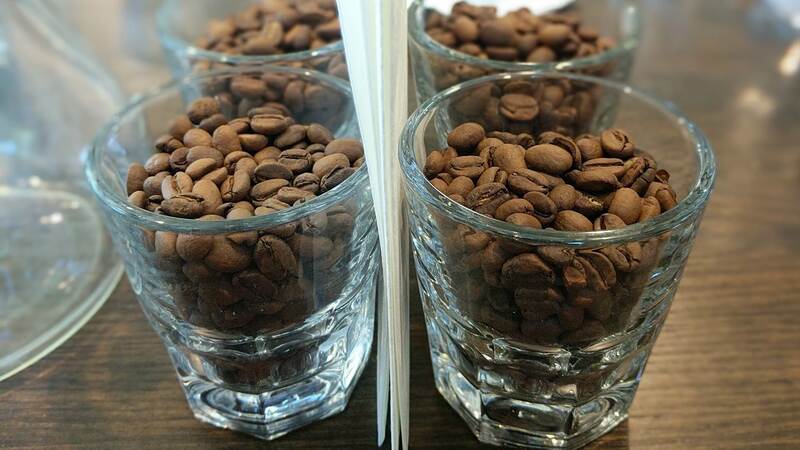 Because they take just as much time dialing in that coffee (and sourcing their beans from exclusively Florida-based roasters) as most shops do perfecting their espresso. It also doesn’t hurt that they partner with the Hall to offer premium coffee-cocktail combos like the “Americano Americano” (ask Ty to tell you the story behind that drink) and the Ryes and Shine. Buddy Brew is the best coffee shop in Tampa for meeting the locals. No mention of the best coffee shops in Tampa would be complete without Buddy Brew. Buddy Brew is one of the oldest local coffee roasters in Tampa still going strong. In addition to their expansive original location (which has grown over the years as they’ve grabbed neighboring real estate), Buddy Brew now has a spot in near-by downtown Sarasota and at the hip Oxford Exchange — a popular Tampa spot for food, conversation, and shopping. If you go you have to try the “Buddy Brew Screw”: a shot of espresso served with grapefruit juice and a spoonful of salt. Take it like a shot (first salt, then espresso, and finally the juice) and you’ll find it extends your caffeine buzz out all day long! 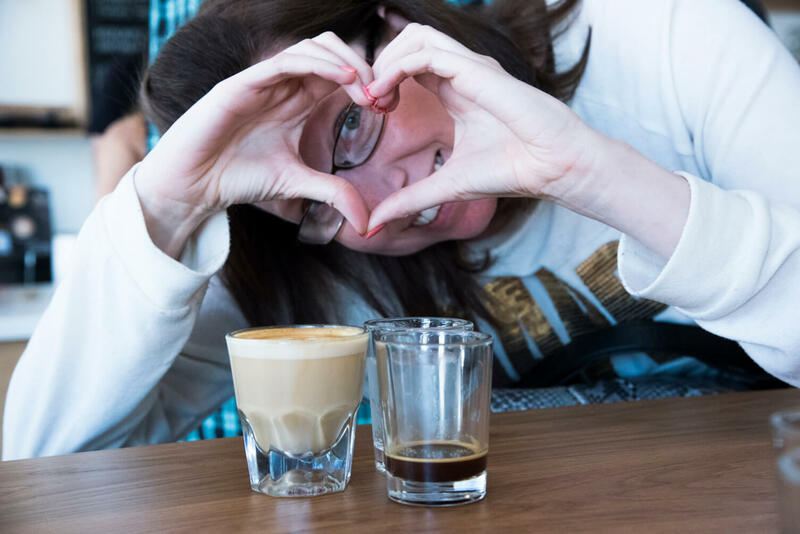 Craft Kafe is the best coffee shop in Tampa to bring a friend when they visit Tampa Bay. No list of the best coffee shops in Tampa would be complete without hitting the Sunshine City: St. Petersburg’s Craft Kafe. Craft Kafe is the shop I’m most likely to bring an out-of-town friend to. It’s got a cool rustic vibe with found wood furniture and dramatic lighting. 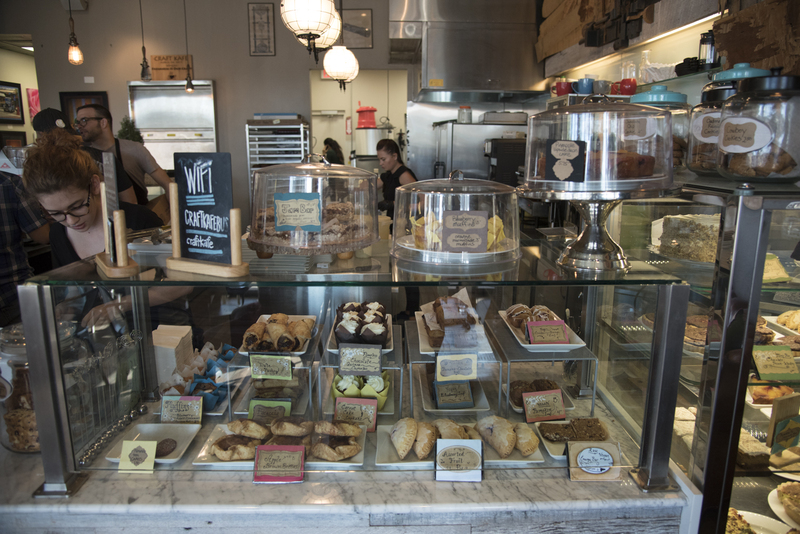 Craft Kafe features a 100% gluten-free bakery, but you wouldn’t know it if they didn’t tell you (seriously, it’s the best!) Add to that an incredibly knowledgeable staff, top coffee from the best roasters around the country (including Arkansas based Onyx Coffee Lab) and regular latte art throw-down barista competitions and you’ve got a shop every die-hard coffee fan will want to visit as well as anyone who wants the a really great gluten-free muffin. The proof is in the pudding: Craft Kafe is usually very busy so they’ve just opened up a second location on the other end of town. Intermezzo is the best coffee shop in Tampa for a date. Staying in the St. Pete our next Tampa Bay area cafe making the list is Intermezzo Coffee & Cocktails. Intermezzo (Italian for “intermission”) serves up a rotating stock of the best coffee roasters in the country (including Verve and Kuma) as well as a full cocktail bar and creative espresso-based mock-tails like the “Espresso Mint Julep” (a play on a bourbon Mint Julep with espresso substituting for the booze.) Intermezzo is pretty. I mean, it’s basically Instagram-heaven. Very clean white walls with tasteful appropriations and lots of beautiful people. Intermezzo is the shop where I’m most likely to bring a date. Come in the afternoon for a Kyoto iced cold brew coffee (they serve the best one in town) and stay for a cocktail or a mesmerizing omakase-style oyster experience. Caffeine is the best coffee shop in Tampa for busy commuters. 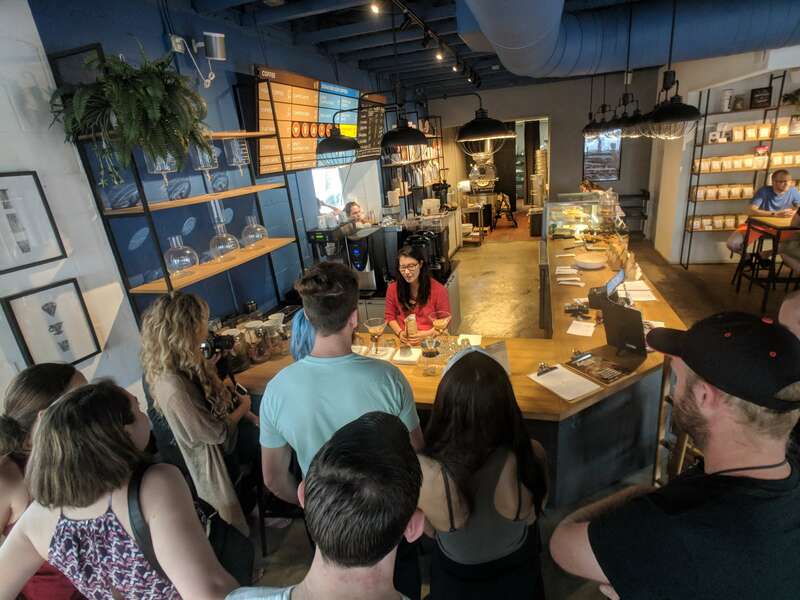 Caffeine opened it’s downtown Tampa cafe is 2016, but it’s the recent addition of the location on Kennedy and Armenia that has everyone excited. Hailing all the way from Lithuania this team (lead by Emilija Dadonaite) roasts their coffee in house (you can see the roaster from the cash register!) They’ve also got delicious food (the lemon aioli egg sandwich is to die for) and their Kennedy Blvd location has a drive through!! 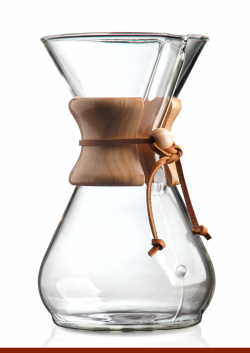 Add to that one of the most impressive slow bar (think: pour over, Chemex, Aeropress) menus in Tampa and you’ve got a recipe for an amazing coffee shop. Caffeine is the shop with the friendliest staff and it’s my favorite shop to invite my best friend to come work with me from. 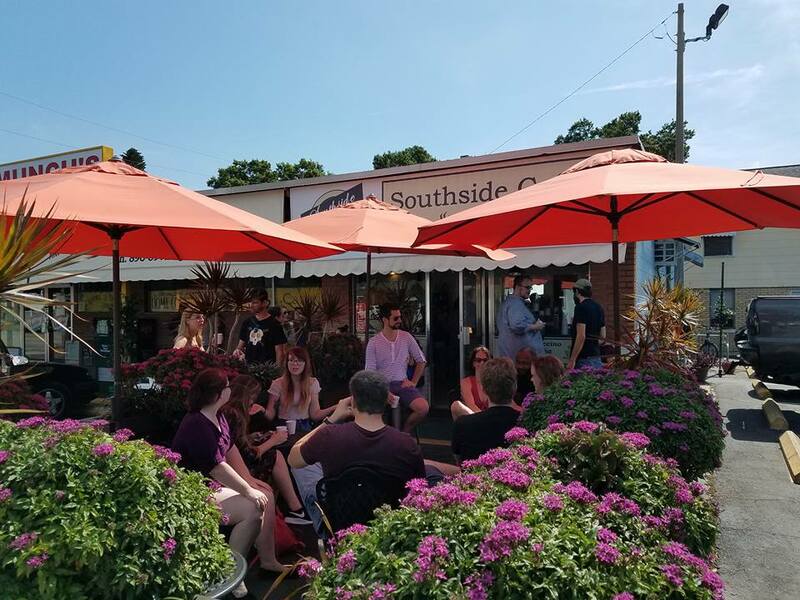 Southside Coffee Brew Bar is the best coffee shop in Tampa to get a cup of coffee everyone will love. With the cheeky slogan “Best Coffee in the Hood” emblazoned on their shirts you can tell that Tampa Bay coffee gem Southside Coffee Brew Bar is a down-to-earth spot. What you might not realize on first blush is that it’s also home to one of the best cups of coffee in Tampa. Bar none. Proprietor Sheila Smith has been working in coffee for the better part of two decades and it shows. Ask her to take home a 1/2 pound of her house blend or one of her rotating guest coffees (roasted fresh weekly) and you’ll never go back to your tin can espresso. 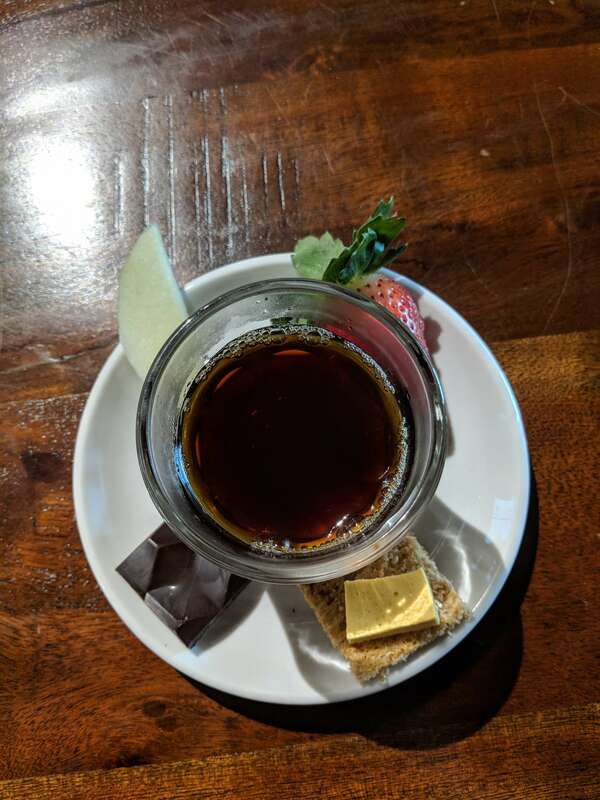 Southside Coffee Brew Bar also features fun drinks like the spicy “Mexican Mocha” as well as Kratom, Kombucha, and and Nitro infused cold-brew coffee. Located next to the famous “Munches Dinner” (featured on the Food Network’s “Dinner’s Drive-Ins and Dives”) Southside customers can grab a coffee and walk it next door to enjoy with their breakfast or just stay and hang out on the patio under the shade of native Florida plants while you chat up the locals — who are there every day, to be sure. Hause is the best coffee shop in the Clearwater-Largo area of Tampa Bay. The Tampa Bay area includes lots of smaller cities like Largo and Clearwater, but to locals, it’s all Tampa Bay. Located 20 miles North of St. Petersburg in Largo, The Hause Coffee Shop is one of the best cafes in the Tampa Bay region. Convenient to St. Pete, Seminole, Largo, and Pinellas Park Hause serves an otherwise underserved area of Pinellas County. They offer a great spacious cafe that regularly hosts open mic nights and occasional free coffee mornings. Serving up Tampa coffee roaster Buddy Brew, the staff at Hause are curious and approachable. They are constantly improving their coffee offerings and it shows! Hause is my favorite spot to “meet in the middle” when my friends live in Clearwater, Dunedin or Safety Harbor. It’s also the spot at which the idea for the St. Pete Craft Coffee Tour was born! Foundation is the best coffee shop in Tampa to get married at. Foundation Coffee really is one of the best coffee shops in Tampa. 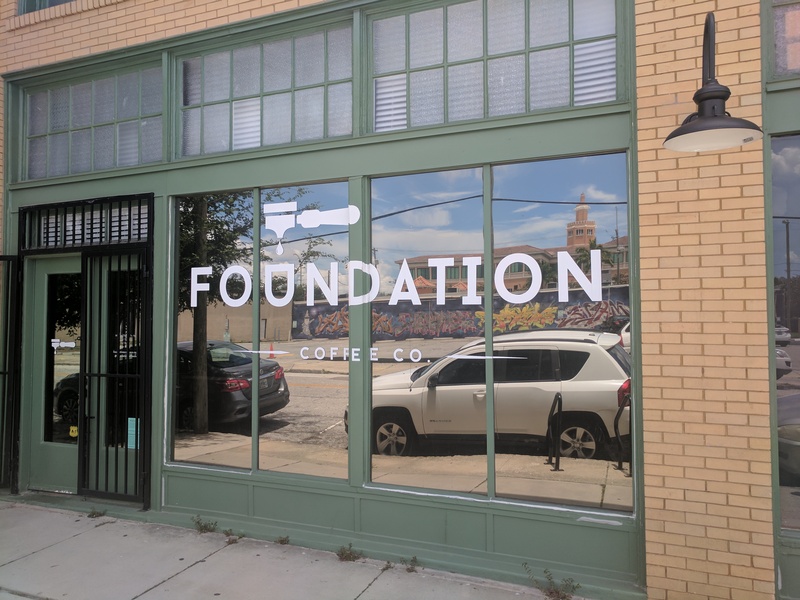 With a great coffee menu featuring house-roasted offerings as well as those from local roasters like Zeal and Kingstate Coffee Roasters, Foundation delivers on great coffee. They have two locations, but the one on North Franklin is my favorite. It’s a beautiful space with indoor and outdoor seating as well as an adjoining space often used for wedding receptions or indoor markets. Foundation is the best coffee shop in Tampa for running into an old friend, or a new one. The Bikery is the best coffee shop in Tampa to get a tire change and an excellent cortado. 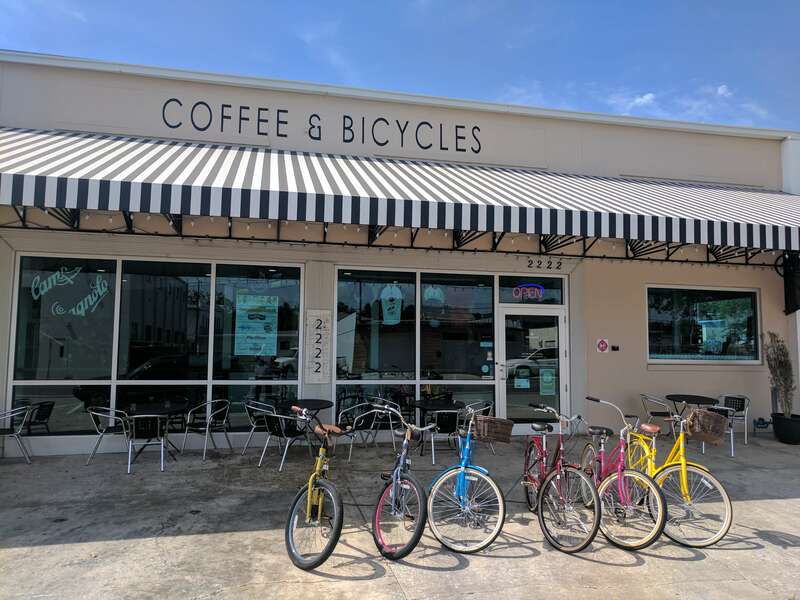 One of the best coffee shops in Tampa is also a high-end bicycle shop. Opened in 2016 The Bikery is a unique concept whereby a full service bike shop has a full coffee cafe inside of it. If you haven’t been you’d be forgiven for assuming they couldn’t do both well, but you would be wrong. Father and son owners: Neal and Taylor Norton split the coffee and bicycle duties respectively and each takes pride in ensuring their customers get an exceptional experience. 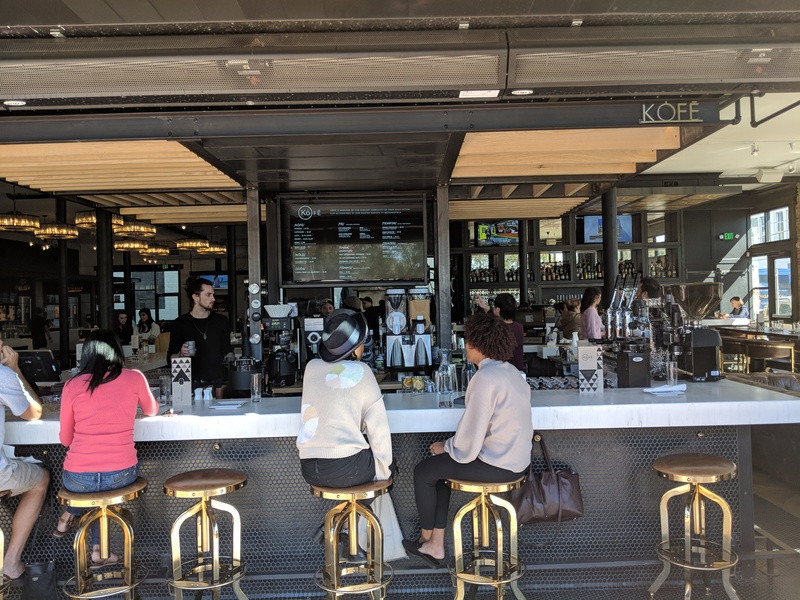 The Bikery features amazing roasts from around the country, the best “4 minute coffee” you’ve ever had, and an exceptionally well-trained staff who specialize in making fantastic drinks from cortados and cappuccinos to flat whites and brewed coffee. Join up for their community bike ride (every Saturday) or just ride on in (yes you can park your bike inside their spacious cafe!) The Bikery is best place to get an amazing cappuccino while you wait for your bicycle to be repaired. Blind Tiger is the best coffee shop in Tampa to study for a test or outrun the law. The Blind Tiger Cafe has three locations (Ybor City, Seminole Heights, and SOHO) and they likely won’t stop there. This speakeasy inspired Tampa cafe is serving up house roasted beans that are “so good they should be illegal” along with creative tasty drinks like the popular “Cafe Bombon” which adds steamed sweetened condensed milk to the traditional Cafe Late formula or their Espresso Affogato (espresso and gelato.) A popular spot for studying, relaxing, or just grabbing a tea or coffee, Blind Tiger is a must-hit and one of the best coffee shops in Tampa. Bandit is the best coffee shop in Tampa to sport a beard or eat a vegan donut. 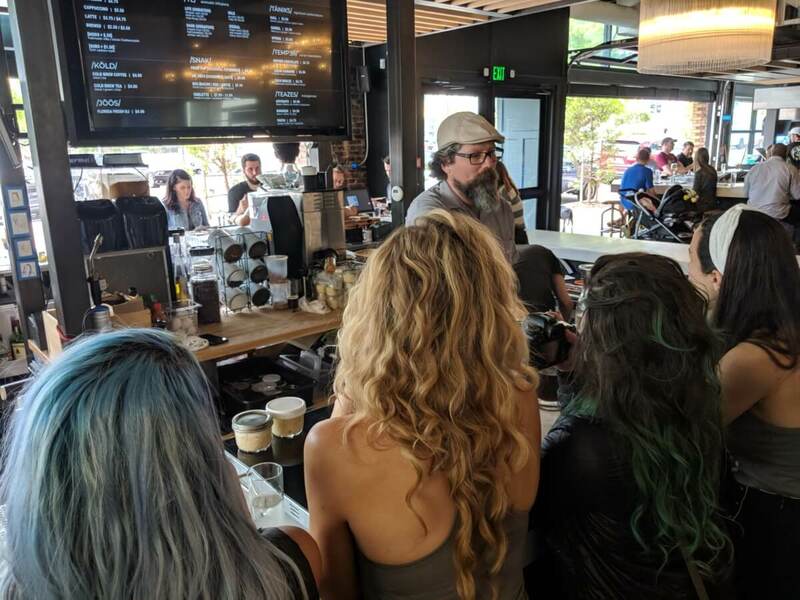 From their days slinging coffee in local markets to the opening of their beautiful shop in St. Pete’s Grand Central district Bandit has quickly risen to become one of the most popular coffee shops in Tampa Bay. These days they are roasting their own single-origin coffee (they share space with Tampa roaster King State Coffee), supporting important causes (like hurricane relief for Puerto Rico), and creating a space that attracts a slew of young professionals (Macbook Pros in hand, of course.) With a lot of space to work and a bright clean look, Bandit is my favorite spot to bring my laptop to work while I sip on a delightful pour-over coffee. Roasted last week, of course. Union is the best coffee shop in Tampa to spend a whole day at. Finally on our list of the dozen best coffee shops in Tampa is the newest shop in town: Union. 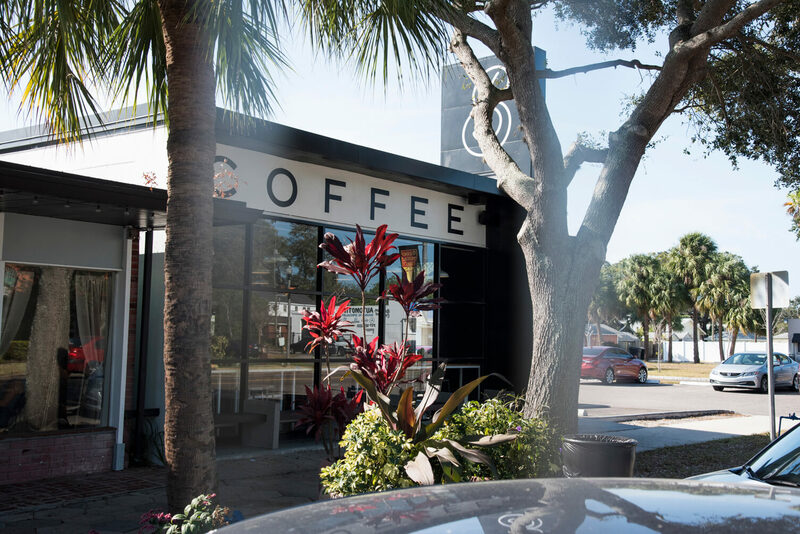 Located at the brand new Armature Works building in the historic Tampa Heights neighborhood (a beautiful mixed use space featuring a neighborhood market, food hub, and event space) Union may be new, but they are making a big impression on the Tampa coffee scene. 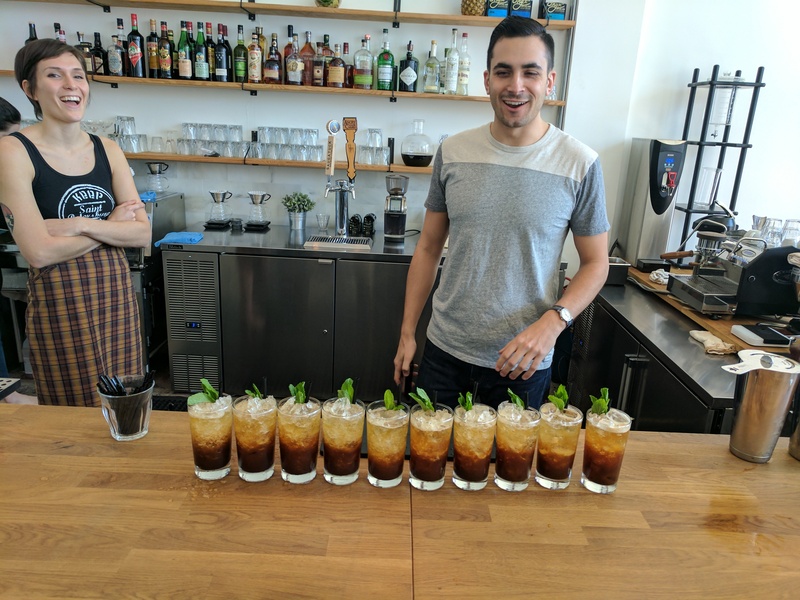 Owner Joel Davis has been brewing up cold brew coffee (at nearby Hidden Springs Ale Works) under the name Commune and Co, supplying many Tampa area coffee shops for years, but now has his own space. Union has one of the most knowledgeable staffs in all of Tampa and they are serving up some of the most unique beverages such as the the Horchata Latte, Coffee Cola, and natural wines. Union is effectively taking the flavors of Old Tampa and reimagining them in modern, well thought out beverages. Union (and Armature works) is my favorite coffee spot in Tampa to spend a whole day people watching while I sip a delicious cafe beverage. The hardest part about writing a list like this is knowing where to stop. 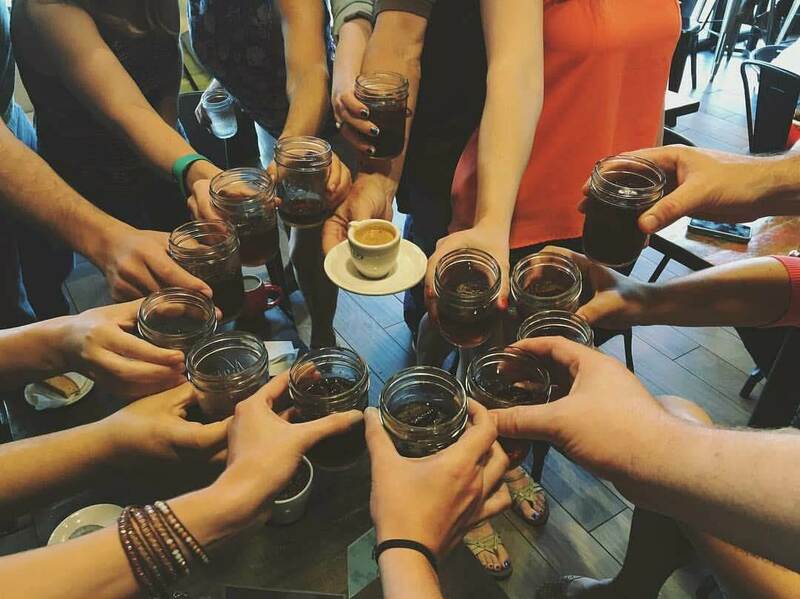 Tampa has so many amazing coffee shops I couldn’t possibly hit them all in this one post. What are your favorites? Which Tampa Bay area coffee shop do you want to try next? 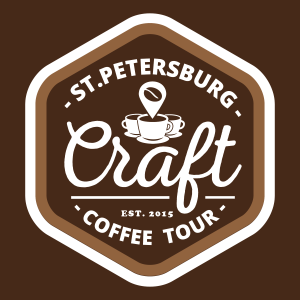 Send me an email at: brendan@stpetecoffeetour.com to let me know!